Boom! 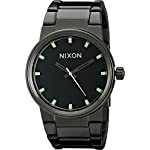 There goes that goodness with The Cannon watch from Nixon®. Custom solid stainless steel case. Hardened mineral crystal. Triple gasket stainless steel crown and a stainless-steel screw down caseback with spring pin lugs. Tapered stainless steel three-link bracelet with a stainless-steel double locking clasp with micro adjust. Miyota Japanese quartz three-hand movement. Dial features:• Surrounded by a big solid stainless steel indices.• Custom molded hands. Waterproof as much as 100 meters. Imported. Measurements: Case Height: 40 mm Case Width: 39 mm Case Depth: 11 mm Band Width: 1 in Band Circumference/Length: 10 in Weight: 5.6 oz This product could have a manufacturer’s warranty. Please seek advice from the manufacturer’s web site or contact us at [email protected] for full manufacturer warranty details. WATER RESISTANCE CASE RATINGS: as much as 100 meters includes surfing, snorkeling, spear fishing, shallow swimming, submersion, rain splashes and the like.